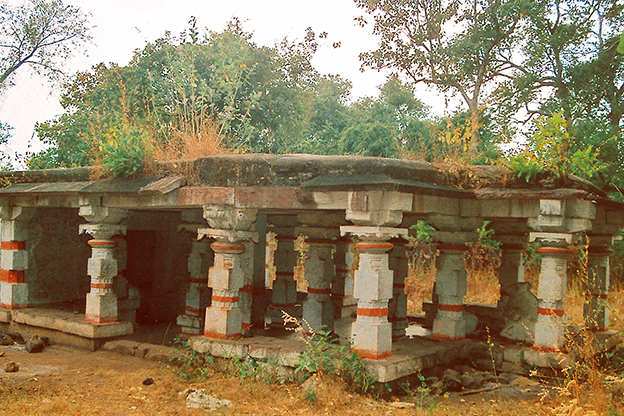 This small shrine located about 3 km from Srisailam and frequented by pilgrims since ancient times. 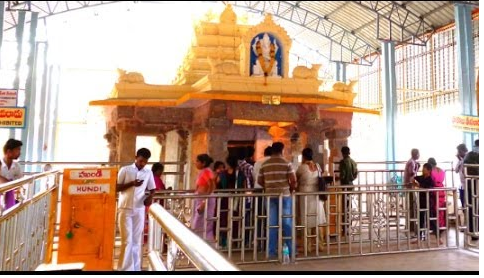 The traditional belief is that the Ganapathi in this temple keeps regular account of all the pilgrims to tender ‘Sakshyam’ (evidence) of their visit to this Kshetram and is named as Sakshi Ganapathi. The sculpture of this deity is exquisitely made holding a book in the left hand and ‘Kalam’ (pen) in the right hand in such a way as noting down the names of devotees. This picturesque spot is on the way to Srisailam of above 5 km away in a serine atmosphere. According to the tradition at this place God Siva appeared to a potter devotee in Atika (piece of Pot) and hence named as Atikeswaram and later it became Hatakeswaram. There is a temple dedicated to Sri Hatakeswara Swamy and is a stone structure datable to 11th-13th Centuries A.D. This most sacred spot is located at about 8 km. from the main temple at a height of 2830 feet above the main sea level. It is the highest peak of Srisailam. The Skanda Purana proclaines that a mere glance of this Sikharam frees the human soul from the fitters of re-birth – “Srisaila Sikharam Drustva Punarjanma Na Vidyathe”. – There is a temple dedicated to Sri Veera Shikara Swamy and locally known as Sikhareswara Swamy. This temple in as ancient stone structure and historically the Reddi Kings have constructed a flight of steps to this in the year 1398 AD and also a Pushkarini (Tank) at this place. This place gives a panoramic view of the entire temple of Srisailam including the meandering river Krishna. This most beautiful scene spot in surroundings of Srisailam is located about 4 Km from the main temple. Tradition records that Bhagavan Adisankara performed penance at this place and composed the famous Sivanandalahari here. His Holiness Kanchi Paramacharya confirmed this and marble statues of Sarada Devi and Sankaracharya installed there and daily regular Poojas are being offered also. This spot is located in a narrow valley approachable by a flight of steps where subterranean streams of pure water with musical sound reverberating the surroundings. According to local folk these streams are known as Phaladhara Panchadhara and these two signify their origin from the fore head of God Siva the Phaladhara (Phala = fore head, dhara = Stream) and denote the five aspects of Siva, the Panchadhara (Pancha = five, dhara = Stream). The water from this stream flows in interrupted at all seasons. The Skanda Purana describes the flow as “Bhogavathi” and it joins in the river Krishna. The Mathas played an important role in the History and Cult of Srisailam. They were well associated with the religious and social activities of the temple in the medieval times. These Mathas acted as educational institutions dedicated to higher learning in various branches and catered to the intellectual and spiritual needs of the society. Srisailam became a powerful Saivate centre because of the existence and activites both spiritual and profane of these Mathas. The origin of the Mathas seems to be as early as 7th Century A.D. The historical inscriptions speak about Eleven Mathas in Srisailam. But only 5 Mathas are still in existence. These Mathas are rich in sculptural and architectural wealth, where several Sivalingas were installed and worshipped since centuries. These Mathas also looked after the administration of the temple in the medieval period. These mathas are popular as the Panchamathas namely Ghanta Matham, Bheemasankara Matham, Vibhooti Matham, Rudraksha Matham and Sarangadhara Matham. There is also a temple of Veerabhadra at the row if these mathas and is named as Veerabhadra Matha. These existing Mathas are located within a distance of 2 km to the west of the main temple. The temple of Istakameswari is located in a dense and picturesque forest environment about 21 kms to the east of Srisailam. This temple is an ancient structure datable to 8th - 9th centuries A.D. The sculpture of the deity is very unique and have no parallel anywhere in India. The Goddess has a serene and beautiful smiling face which at once captures the attention of one and all. It is believed that by having the darshanam of Istakameswari Devi one can fulfill all the desires. Located between two steep hills, the rock ledge endowed with spectacular water falls, Bhemmuni Kolanu is the place through which the ancient foot path of Srisailam from the Southern and Western sides pass. This pathway with excellently laid steps of solid stone slabs can be seen even today which are beginning from Nagalooty, a temple complex, in the dense forest. Traditionally this place is said to have acquired its name through an epic episode. According to that story the Pandavas during their pilgrimage while in Vanavasam came to this place. At that time Draupadi was feeling with thirst and they could not find water anywhere in the vicinity. Due to this Bheema got angry and hit the hill with his mace. As a result, the hill was split into two parts and water came up from its middle and later the stream named as Bheemuni Kolanu. Pleased by this flow of water, Bheema is said to have consecrated a Sivalinga at the place which was referred in Skanda Purana as Bheema Linga and the spring as Bheema Gundam. At present there are two dilapidated temples which are locally known as Bheemeswara and Bheemunikolanu temples and both are datable to 8th-10th centuries A.D. Literature describes the Bhairava, one of the forms of Siva as the boom bestowed. As many as eight forms of Bhairava, each having another eight sub forms, thus amounting 64 forms are described. Commonly associated o Tantric, the Bhairava Cult appears to be one of the most prominent cults in the religion of Srisailam. Bhairavasela a place of Bhairava cult at Srisailam is situated amidst enchanting natural beauty and having a prominence since ancient times. This place is located of about 13 km from Srisailam and reached through narrow forest tract from the 39th mile stone on Dornal – Srisailam highway, close to Sikharam. 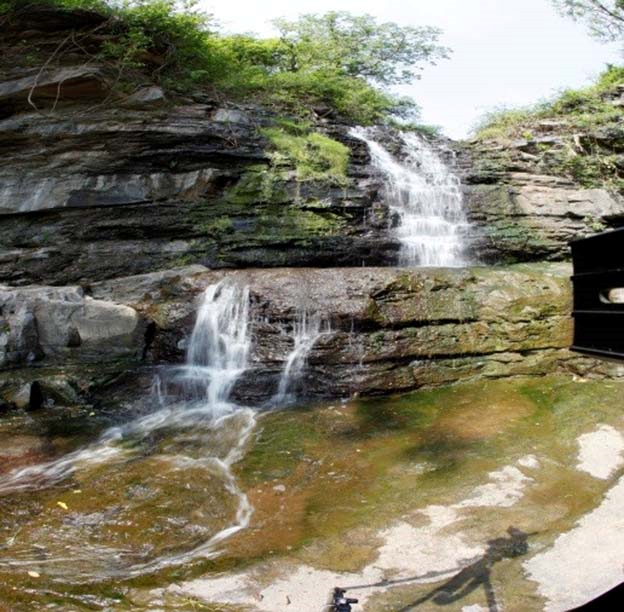 This spot consists of a cave and beautiful water falls. 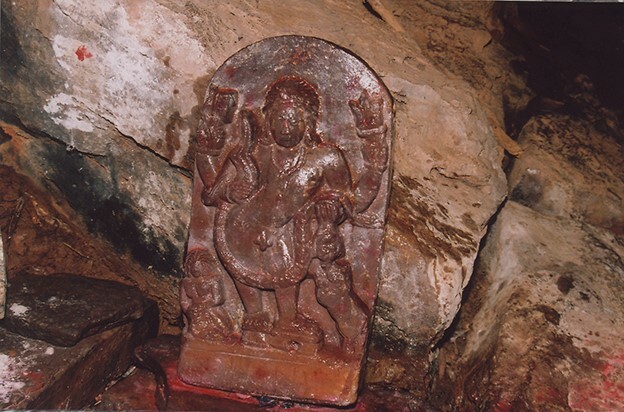 The cave houses a rare and beautiful sculpture of Bhairava done in reddish quartzite. The sculpture is only one of its kind in which a Kapalika depicted at the feet of Bhairava, who is shown in a tribhanga standing posture having padukas. Similar sculptures are not to be found elsewhere. The local tribal of this place chencus worshipped their God Bayanna at the same cave in the form of natural blacks of stones and so the place is locally known as Bayanna Sela. The entire region is blessed with scenic beauty in the form of lust green vegetation and meandering water falls, which has been enthralling visiting by their silvery cascade. 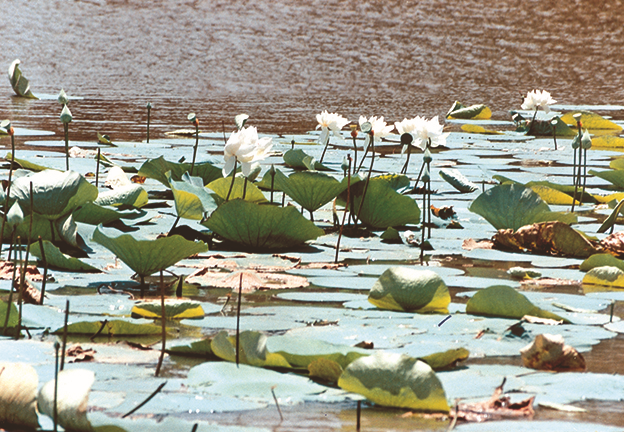 Located in a dense forest setting, Nagalooty is of about 28 km from Srisailam. This place stands as a testimony to the ravages of time and man. Many dilapidated temples, gopuras, pushkarinies and broken idols speaks about its once glorious past. On architectural grounds and iconographical features, the temple and sculpture of Nagalooty can be dated to a period between 13th – 15th Centuries.Commonly associated o Tantric, the Bhairava Cult appears to be one of the most prominent cults in the religion of Srisailam. The ancient foot path to Srisailam from southern and western sides begins at Nagalooty from where excellently laid steps of solid stone slabs can be seen and these steps were constructed by the Reddy Kings in between the period 1326-35 A.D.Among the four ancient path ways of Srisailam, this Nagalooty route is the most popular one and a large number of devotees particularly the devotees of Sivadeeksha and Kannada devotees used this way even today. Nagalooty houses a huge temple complex of Veerabhadra Swamy, which is a stone structure consisting of Garbhagriha, Antharalaya, Mukha Mandapa along with another 18 pillared mandapa. On the left side of the Garbhagriha there is a small chamber which houses Goddess Bhadrakali. The Rajagopuram of the temple is in the eastern side of the temple complex and is in dilapidated condition. At the right side of the temple near the eastern gopuram there is another huge 16 pillared mandapam. Of about a hundred meters to the main temple houses ten handed seated Ganapthi. There are two pushkarinies near to the Ganapathi temple. The pillars of the mandapas are carved with several sculptures such as Natya Ganapathi, Tandava Murthy, Kali, Mahishasura Mardhini etc. At the pathway leading to Srisailam there is a seated Gramadevatha locally known as Kuruvalamma. The Nallamalai Hill ranges are studded with innumerable natural caves and caverns which were over a million years old. Some of them became more famous and played a role in the significance of Srisailam and one such among them is the Akkamahadevi Caves. These naturally formed caves just above the flow of the river Krishna upstream is about at a distance of 10 km from Srisailam. 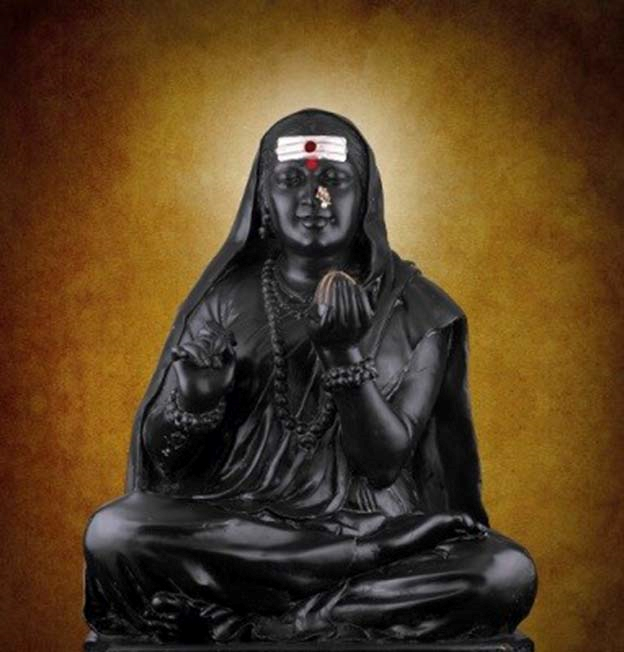 It is said that Akkamahadevi the famous ascetic lyricist and philosopher hailed from Karnataka in 12th Century AD spent some years in these caves doing penance and worshipped the Sivalinga naturally existed in the deep and dark end of the cave and hence named as Akkamahadevi Caves. 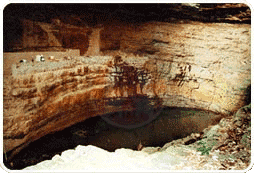 These caves are also considered to be the abode of Siddhas who are said to have practiced the Yogic arts like alchemy for which Srisailam was renowned in the ancient days. These meandering caves of about 250 meters deep in the right side and 150 meters on the left side with natural rocky structures in and around keeps the visitor spell bound. Some loose icons of Kapala Bhairava, Veerabhadra, Mahishasuramardhini and other of medieval period are noticed at the entrance of the caves. 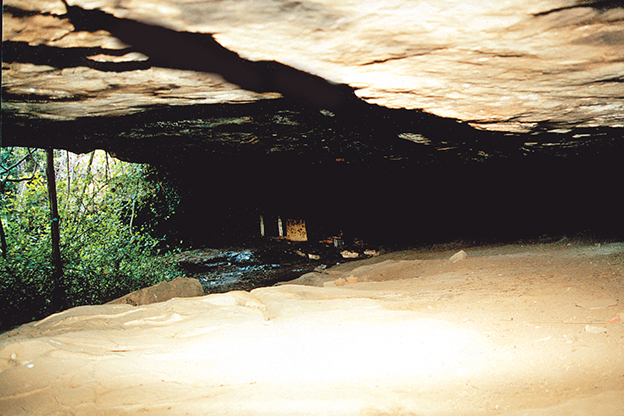 Akkamahadevi caves are endowed with a natural Rock Arch which stands majestically without any support. The surroundings of the caves and its journey through the river Krishna from Srisailam provides a wonderful experience to one and all. The people of Karnataka and Maharastra make it a point of visit in their pilgrimage of Srisialam, particularly during the time of Ugadi the telugu new year’s day. 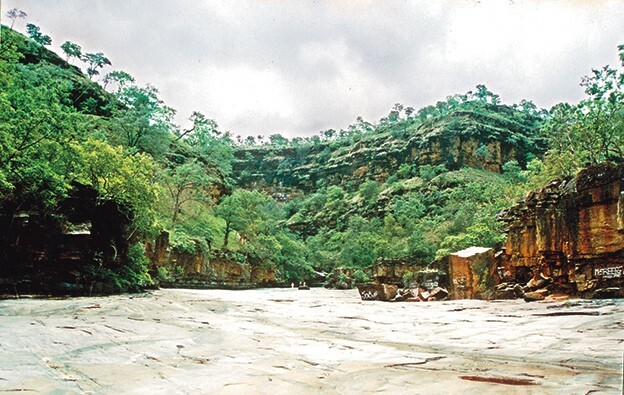 The huge cave like natural Rock Shelter – Kadalivanam is on the left bank of the river Krishna on the opposite side of Srisailam at a distance of 21 km from the main temple. 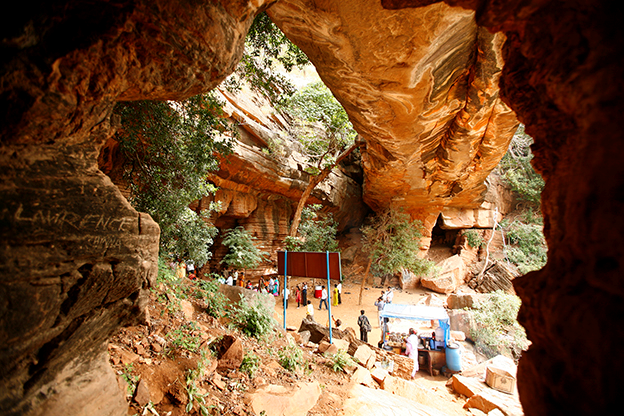 This Rock Shelter can accommodate more than 500 persons comfortably at a time. The place derived its name dell to wild plantain grooves.After reaching the Kadalivanam revu which is at the bank of river Krishna, there is a foot path of 11 km to Kadalivanam. This excellent spot is considered to be extremely sacred in the sacred complex of Srisailam. Srinatha is renowned poet of 15th Century in his Kasikhandam gloriously praised about this place. 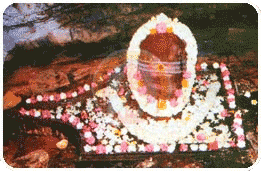 It is said that Bhagavan Dattatreya and his other incarnations is believed to have dwelling at this place. Allama Prabhu the great Veerasaiva saint is said to have performed penance here. Akkamahadevi a follower of Veersaivisam is known to have breathend her last at this place. Kadalivanam is also considered as Siddhasthalam – the abode of Siddhas who practiced various Yogic arts for which Srisailam is famous in medieval period. Near the rock shelter flows a Perennial stream close to which evidences of prehistoric man in the form of stone tools were discovered.The devotees particularly followers of Datta Sampradayam and also pilgrims of Karnataka and Maharastra visited this place in their pilgrims to Srisailam generally on Ugadi days. 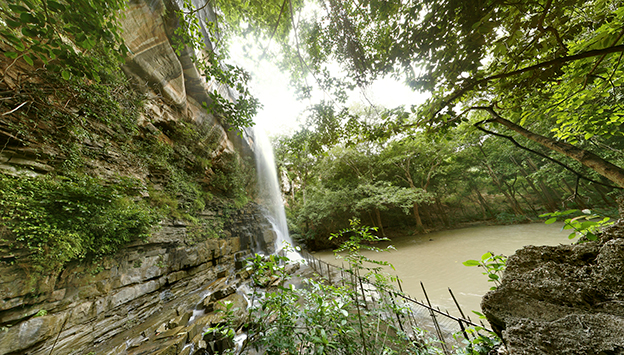 This place is of about 70 km from Srisailam and located in the ancient northern pathway to Srisailam from Umamaheswaram. It is at attitude of 16 9’ north and longitude of 78 41’ east. This place houses one of the most beautiful man made huge water storage tank amidst wild and beautiful forest environment. The tank appears to have been enlarged and renovated in 16th century A.D. The historical remains at this place consist of a temple dedicated to Siva, Devi shrine and a hero stone. The temples of this place have a huge compound wall probably constructed in 16th – 17th Centuries A.D. The Deity of this place is named as Mallikarjuna and Goddess as Bhramaramba. 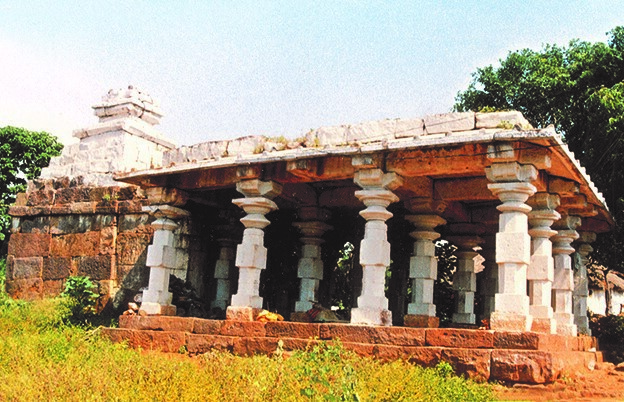 The Mallikarjuna temples is east facing consists of Garbhagriha and Antharalaya. 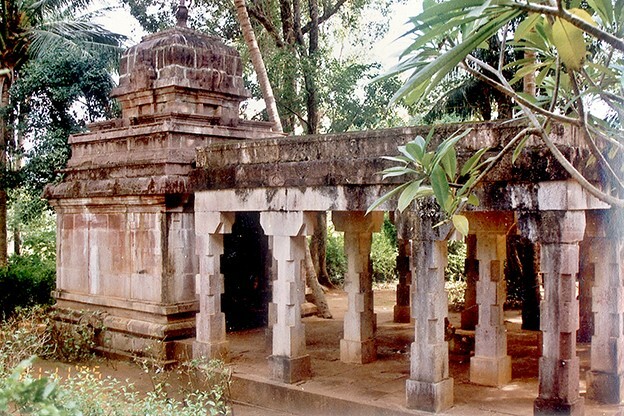 The temple of Bhramramba is towards the right side of the Swamy temple and both these are connected by a mandapa which is a later structure. There are also several small shrines in the temple complex.Those who are interested in observing the ethnographic present cannot miss the place where a small group of Chenchus, the local tribal still leading a primitive way of life. The Nallamalai abound in sacred spots which coupled to their natural beauty have been attracting one and all from ascetic to common since ages. One such sacred spot which was also mentioned in the Skanda Purana is Mallika Theertham locally known as Mallela Theertham. This spot is located about 54 km from Srisailam. It is accessible by taking a diversion at Vatvarla Palli, a small village on Srisailam – Hyderabad highway and a travel of 10 km into the interior forest and has to trek to a distance of above 2 km at the end of the vehicular journey. 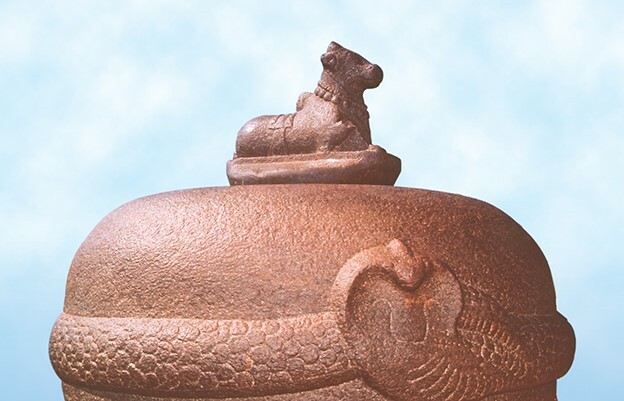 Tradition ascribes that Chandravathi who offered jasmine garlands to God Siva at Srisailam also worshipped the Sivalinga of this place, which is known as Malleswara Lingam. Variously known as Saleswaram and Saileswaram this place is one of the sacred spots of Nallamalais, nearly of about 90 Km from Srisailam. Located in the beautiful forest environment it is at an attitude of 395 feet above the Sea level, at an attitude of 780481 north and longitude of 160061 east. This place is popular not only in folk tradition but also in the puranic lore also. The Sriparvatha Purana, a celebrated literary work of Seshanatha in 16th Century about Srisailam speaks glorifyingly with regard to this place. It is endowed with a cave temple dedicated to God Siva and two ponds named as Sarvesa theertham and Pushkara theertham. This temple seems to be datable to 6th and 7th Centuries A.D., and constructed within the shallow cave with bricks and mortor. Infront of the temple there is a huge water fall from a height of about 200 meters cascade down the hill holding the visitor spellbound with its raw beauty. This place is the most beautiful one which has natural picturesque locales and it is a sight to be seen. This place is one of the most beautiful picturesque and treacherous spot which gives immemorable pleasant and happiness at the sight of tremendous water fall located there. 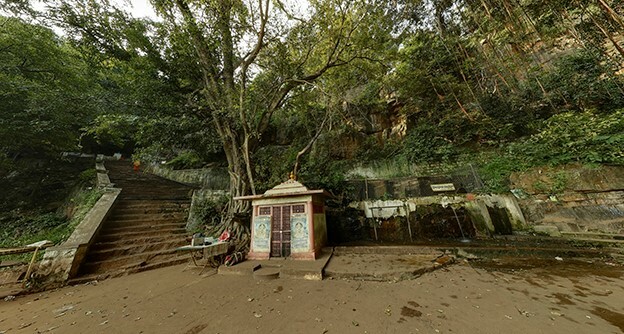 It is of about 36 Km from Srisailam.The sacred complex of Srisailam during medieval times provided shelter to many secret saivaite sects who performed their ritual acts in such inaccessible spots such as this. Hence such places derived the name such as Guptha meaning secret.Shallow -caveThis place contain a small shrine of Siva in a shallow cave along with a broken idol of Ganapathi. The Srisaila Khanda of Skanda Purana speaks about this place and named it as Guptha Mallikarjunam. It is said that by mere seeing this place one can get free off from his sins. This beautiful scenery spot is located just a kilometre from main temple at its northern side. According to tradition, this is the place where God Mallikarjuna Swamy appeared to Sidhha Ramappa who hailed from Sholapur of Maharastra in 12th century A.D. It is said that Siddha Ramappa at the age of 7 years came to Srisailam along with a group of devotees. In Srisailam he searched for God Mallikarjuna Swamy but could not find him. He asked to piligrims for Him and they showed the Jyothirlinga in the Temple. He did not believe and searched everywhere but in vain. At last he tried to fall in the lake of a valley and then God Mallikarjuna Swamy pleased with his devotion, appeared before him and saved him from fallen. Due to this, the valley is named as Siddharamappa valley and the lake at the down of it is named as Siddharamappa Kolanu.The Devasthanam has constructed a flight of steps to this valley where there is beautiful water falls with its pleasant-sound reverberating the valley. This water fall with its silver cascade attracts one and all which flow in all seasons uninterruptedly.The piligrims of Karnataka and Maharastra states visited this place compulsorily in their pilgrimage particularly during the days of Ugadi Uthsavams. This Mandiram is at about 2 K.M from the main temple at its western side. At this place there is a small water stream between two natural rocks and the stream is named as Mallamma Kanneeru (Happy tears of Mallamma), the Devotee of God Mallikarjuna Swamy. Here a Mandiram was constructed to Mallamma in which daily poojas are being offered to Her. The story of Mallamma date backs to 14 the century. At that time there was a village, Sivapuram (also known as Ramapuram) near to Srisailam and Mallamma is hailed from that village. She was born to her parents by the grace of God Mallikarjuna Swamy and she devoted Him from her child hood itself. When Mallamma grew young enough, she got married Barama Reddy, the son of Hema reddy, a rich family of Siddhapurama nearby village. In her in-law’s house also Mallamma continues the worship of Mallikarjuna Swamy and this was unable to tolerate by her mother-in-law and co-sister both are rude in nature. They always ill-treated Mallamma and she was peacefully abiding it. At last they told badly about the character of Mallmma to her husband and he decided to kill her. But by the miracle of God Mallikarjuna Swamy, he known the real fact and changed his aptitude. By this happening Mallamma reached Srisailam, maintained Goshala and worshipped God Mallikarjuna Swamy with Goksheram (Cow milk) besides preaching of Sivathatvam and breathends here.